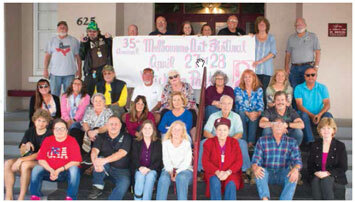 Every year the Festival has been successfully and proudly run 100% by community volunteers. The 2018-19 Committee will make the 35th Annual festival, April 27 and April 28, 2019, even more successful than last year's! APRIL 27 AND 28, 2019 - ART FESTIVAL ! If you are interested in being involved in the planning and organizing of the annual Melbourne Art Festival, become a member of our all-volunteer Committee. As a Committee member, you'll work with a fun and dedicated group of volunteers and help us put on a fabulous Festival. Our committees include: 5-K Run, Advertising & PR, Artists, Beer/Wine, Coke, Concessions, Directory, Entertainment, Finance, Food Court, Grants, Headquarters, Ice, Judges, KidsWorld, Oasis, Patrons, Photography, Production, Recyclables, Scholarship/Auction, Security, Signs, Sponsors, Statistics, Student Art Competition/ Workshops, T-Shirts, Volunteers, Waste Management and Website. We need all types of enthusiastic volunteers whose skills and talents will be put to good use! Committee members are required to attend at least 50% of the general meetings or their chosen committee meetings. General meetings are normally held Wednesday evenings at the Henegar Center, 625 East New Haven Avenue in Melbourne from 6:00 PM - 7:00 PM. For those of you who feel being a committee member is not the level of commitment that interests you at this time, and just want to help for at least three hours the weekend of the Festival, you are welcomed as a Festival Weekend Volunteer. Just let the Volunteer chairperson know at a meeting or e-mail mafinfo@melbournearts.org. Weekend volunteers, please report in at the Volunteer Tent when you arrive; see the Site Map for the check-in location. Thank you!